Issue: You added tracks to your iOS 5, iOS 6 or iOS 7 device using CopyTrans Manager, but on your iDevice these tracks are grayed out and can’t be played. 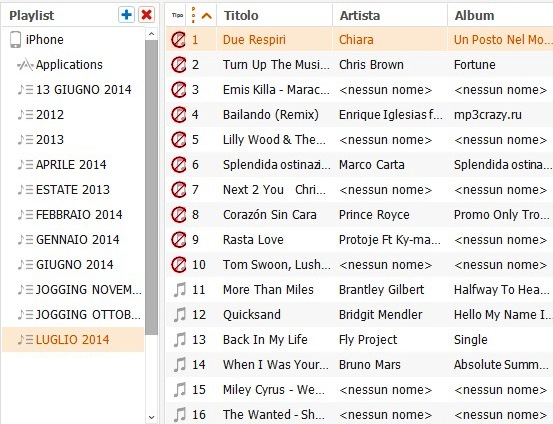 When opening CopyTrans Manager these tracks are marked with a red circle. We’re already working on a fix and will release an update as soon as possible. In the meanwhile please just remove all files marked with a red circle using CopyTrans Manager and add them once again in smaller batches (e.g. 40 tracks/videos per sync). If that doesn’t work, follow the solutions from the following article. Avoid grayed songs on iPhone, iPod Touch or iPad using iOS 5, 6 or 7? To avoid grayed tracks, or tracks marked by a red circle in CopyTrans Manager, please just add small quantities of media files at once, e.g. no more than 40 tracks/videos at the same time.